The statues of male statesman opposite the Houses of Parliament now have a woman in their midst. 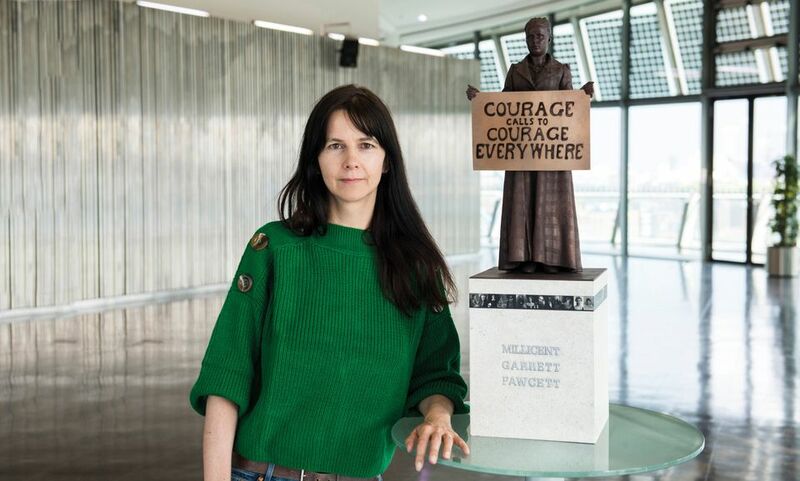 Prime Minister Theresa May and London Mayor Sadiq Khan were among the crowds attending today’s (24 April) historic unveiling of Gillian Wearing’s statue commemorating the life of Suffragist Millicent Fawcett in Parliament Square. Wearing’s bronze is not only the first ever monument to a woman to be erected in Parliament Square, it is also the first statue in the area to be designed by a woman. It was commissioned as part of this year's centenary of the 1918 Representation of the People Act that gave some women over the age of 30 the vote, and is part of 14-18 NOW, the cultural programme marking the centenary of the Great War. 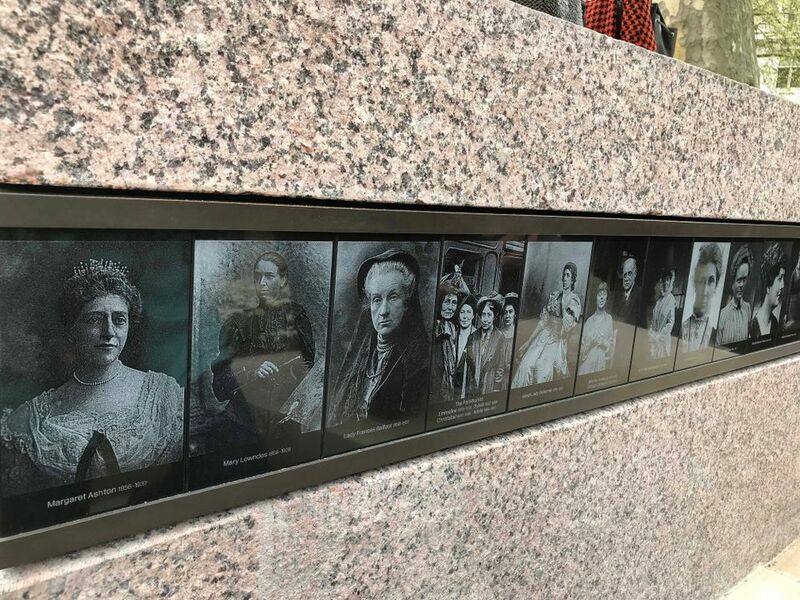 Based on an image of the Suffragist leader holding a banner reading “Courage calls to courage everywhere”, the work also features photographic etchings on its plinth depicting 52 women and a handful of men who were central in the push for women’s suffrage. In advance of the unveiling ceremony Gillian Wearing talked to The Art Newspaper about this historic work. The Art Newspaper: Why did you choose Millicent Fawcett? Gillian Wearing: Fawcett was chosen by [the British journalist and feminist activist] Caroline Criado Perez who led the successful campaign to put [the statue] in Parliament Square. But I am equally delighted she was chosen as she is the pivotal person who got the vote for women in 1918. What is so special about her? She did a lot of work behind the scenes, meeting Members of Parliament, trying to negotiate. She spent six decades of her life doing this, from getting signatures for the first petition in 1866 to becoming president of the National Union of Women's Suffrage Societies (NUWSS). This had a very large membership of 100,000 women. The Suffragettes had split from this group to form the Women's Social and Political Union (WSPU). The statue shows Fawcett in middle age. How did you decide how to portray her? Caroline advised me on this, as we see very few bronze statues of middle aged women. Also all the statues in Parliament Square are of men who were captured at moments they were important. That is from middle to old age. Winston Churchill's sculpture was derided by some when it was unveiled as it showed a frail old man. But now we accept it as a symbol of him. And I feel the same with this sculpture. What is important is the achievements of Fawcett and the moment she was at her most influential, which was when she became president of the NUWSS in 1907 at 60 years old, having been a member for ten years. Does your depiction come from a specific source—a portrait or photographic image? No, there are not many [images] of Fawcett at this age. There are a few of her sitting at a desk in a walking suit and she does wear a walking suit in the statue. 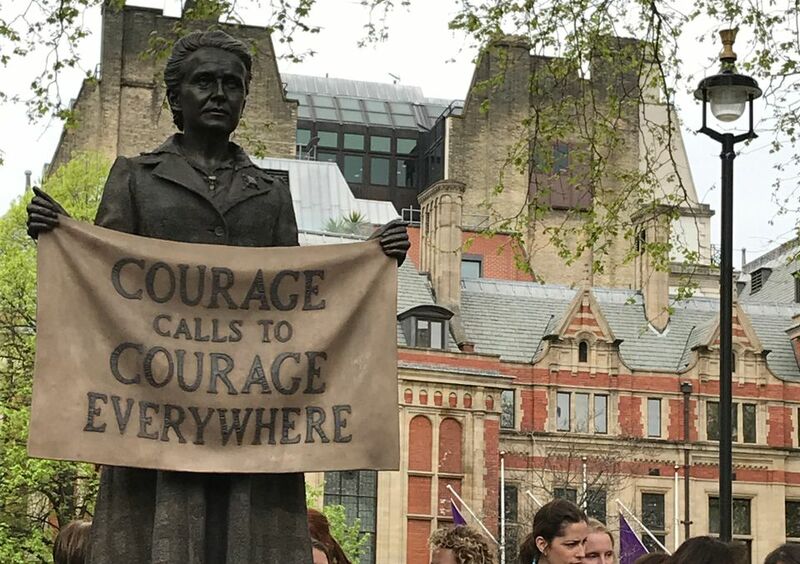 I wanted her to hold a banner with the words "courage calls to courage everywhere"—a fabulous and generous rallying cry and one she wrote in respect of [the suffragette] Emily Wilding Davison who was killed by the King’s horse at Epsom Derby. Fawcett admired the Suffragettes but did not believe in civil disobedience. In this quote she both acknowledges the ultimate sacrifice of Davison as well encouraging us to think of the selfless acts of others. You have also put photographic etchings of other suffrage campaigners—including the Pankhursts—around the plinth. What was the motivation for this? When you think of women's suffrage you think of it being a movement. I thought the only way we can really think in terms of that is to have images of other women on the plinth—to give a further human face to this cause as well as having Millicent standing proudly above. One Suffragist, Jessie Craigen, doesn't have an image (most likely because she was poor and couldn't afford to have one done) [so] she is represented with a blank tile with her name underneath. And in perfect serendipity, when I placed her by chronology of her date of birth, her tile is situated in the front of the plinth smack bang in the centre of the tiles. A prominent position not to be overlooked. I had originally thought of only having Suffragists but then realised that the general public will not know the difference between the two groups. Plus, many women moved from one group to the next [so I thought] that it would be better to be as inclusive as possible. So a meeting was arranged with suffrage academics and historians and we gathered a list of names this way. There are 55 women and four men on 52 separate tiles. What do you want the monument to convey? How campaigns succeed, and how inspiring political activists are. How do you feel about being the first woman to create the first statue of a woman in Parliament Square? Fantastic, daunting and overwhelming: the latter two not because of my gender but the responsibility of doing my best for Millicent Fawcett.